For decades, Ottawa has been a global leader in telecommunications technology. Today, Canada’s capital is one of the hottest and most diverse tech hubs in North America. Ottawa’s high concentration of technology talent, competitive business costs and quality of life attracts companies from around the world. To successfully relocate and expand, Invest Ottawa offers services to support companies throughout their life cycle. Invest Ottawa supports six high growth Knowledge Based Industries (KBI) that collectively employ 68,000 people in 1,750 companies. With the second highest concentration of scientists and engineers in North America and the highest concentration of tech talent in the nation, Ottawa is a recognized source of innovation, creativity and highly sought after talent that has produced industry leading breakthroughs that advance global competitiveness. 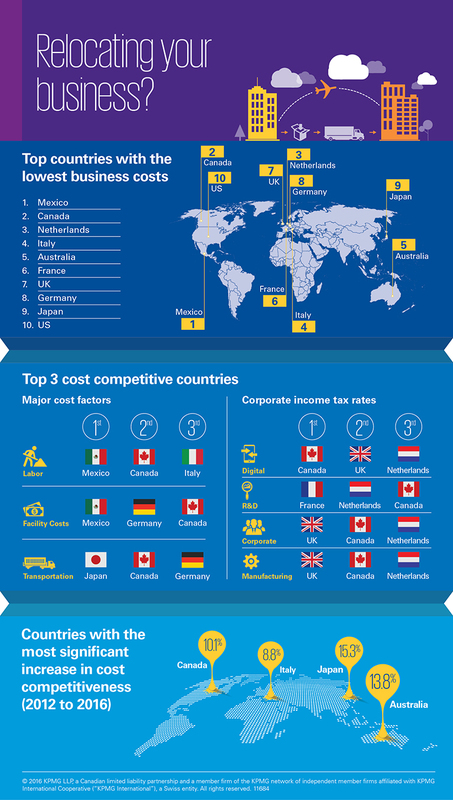 Total business tax costs in Canada are the lowest in the G7. As a result, operating a highly knowledge-based business in Canada provides a competitive edge. As a dynamic technology ecosystem, Ottawa features many assets that distinguish it from other cities in North America. Rated the most business friendly environment and third best city for FDI out of 77, mid-sized cities, in the Western Hemisphere – it’s no surprise why Ottawa is home to more technology companies than Vancouver, Montreal, Calgary and almost five times more than Waterloo. Additionally, as Canada’s most affordable place to live among large North American cities, Ottawa offers competitive business costs for talent acquisition and research and development, all supported by competitive government incentives. Major funding programs include: Scientific Research and Experimental Development Program (SR&ED), Industrial Research Assistance Program (IRAP) and Jobs & Prosperity Fund. Located in the heart of Eastern Ontario, the Nation’s capital is less than two hours away by air from major North American markets including: Toronto, Montreal, New York City, Boston and Chicago. Combined with direct flights to major hubs in Europe, such as London and Frankfurt, Ottawa gives your company easy access to major clients and consumers. Ranked as the Top Canadian Tech Hub To Live and Work In, Ottawa is bursting with innovation. Home to more than 1,750 technology companies, including international heavyweights such as IBM, Ciena, Microsoft, Amazon, Nokia and Huawei and homegrown champions such as Shopify, You.i TV, Spartan BioScience, Blackberry QNX, Mitel, Kinaxis and Ross Video, the business ecosystem includes technology companies of every size and expertise. As an example of the city’s ability to nurture successful enterprises, Ottawa technology companies have raised more money in IPO’s over the last five years than all the major Canadian cities combined. What makes the ecosystem globally competitive is its vast research and development (R&D) expertise. Overall, Ottawa leads in R&D spending per capita and accounts for 90% of Canada’s industrial telecommunications R&D. Coupled with commercialization centres such as the Centre for Next Generation Networks (CENGN) and a handful of incubators and accelerators such as, Lead to Win, Startup Garage, The Code Factory, Invest Ottawa, and L-SPARK, Ottawa enjoys an enviable innovation culture. As a G7 capital, Ottawa is the political heartbeat of Canada with proximity to a large concentration of policy makers, government departments, and 65 federal research labs. Proximity to government offers strategic advantages for procurement opportunities. In fact, the federal government spent +$2.89 billion on goods and services from local firms in 2015-2016. Factor in the 130 embassies located around the city, Ottawa offers a global network right in your backyard! Ranked as the most affordable among all Canadian and U.S. cities and Mercer’s top 20 for global quality of living, Ottawa is a world-class capital, globally recognized as a diverse metropolitan hub, with a friendly atmosphere and magnificent natural beauty. Affordable housing, low taxes, low crime, good transit infrastructure, strong arts and sports community, and access to healthcare have catapulted Ottawa to first place in MoneySense Magazine’s Best Place to Live in Canada, 2017. In addition, five Canadian cities, including Ottawa, share 16th place on Mercer’s personal safety list. By comparison, no U.S. cities have made it to the top 50 in terms of personal safety. Lush green spaces and natural oases (populated with 500 species of wildlife) can be found all over the National Capital Region. Visitors can also enjoy the region’s impeccable cuisine and attend as many as 180 different annual festivals, fairs, and special events tailored for any chapter of your life. With a vibrant entertainment scene and breathtaking landscape, Ottawa is considered one of the top ten cities for the following rankings:Best Place to Raise Kids, the Best Place to Retire and the Best Place for New Canadians. Overall Ottawa is an ideal city to live and work! For more information about working in Ottawa check out our Work in Ottawa webpage! Follow our Global Expansion teams activity in real-time!